The head is strong, broad, and rounded from frontal view; slightly longer than wide in profile. Cheeks are full. The "slightly longer than wide" is added to prevent a Persian or grapefruit shaped head. 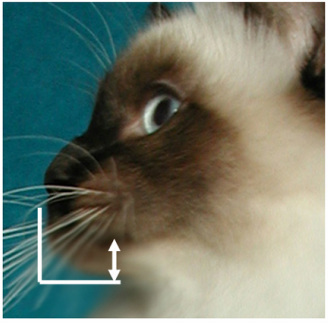 When the head is more than "slightly longer" it becomes "wedge-shaped" like the Siamese head. 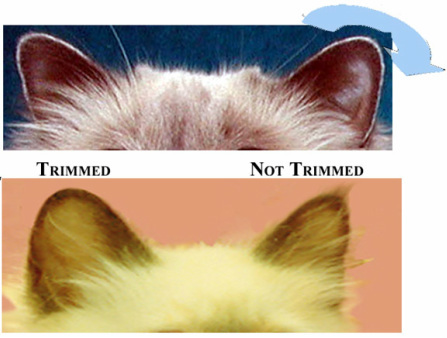 These three characteristics help to further define the rounded look of the Birman head. A full muzzle with strong chin and full cheeks. There seems to be a tendency towards weak chins lately. From the front the cats have a pleasing look, but viewed from the profile you notice the receding chin. Some judges penalize more for this than others. Just because the chin is receding doesn't mean the "bite" is out of line. "Bite" is the term used to describe the fit of the upper and lower teeth. 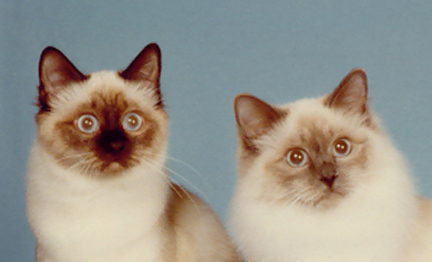 It isn't really discussed in the Birman standard. Not being an extreme head type there is very seldom a problem with bites, but I have illustrated them to show the differences. The chin has good depth, forming a perpendicular line with upper lip. The muzzle has medium length, with enough width to prevent a pinched look. 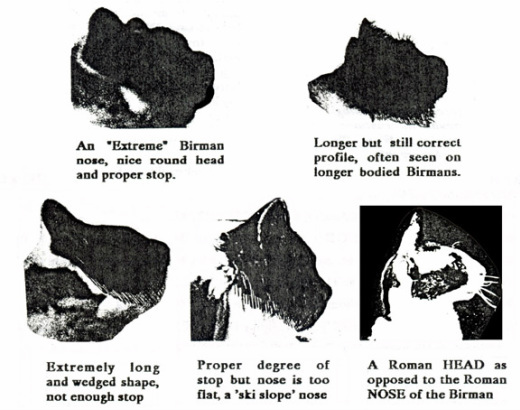 The nose is medium in length and is roman in shape with nostrils set low. This has become a popular "test" for some of the judges, either it has a prominent Roman nose or it doesn't win. The nose should definitely be Roman in shape, in other words convexly curved. The curve is accentuated by the low set nostrils. Sometimes the nose is Roman but there isn't a distinct "stop" to separate the forehead and the nose. So there needs to be a combination of the definite "stop" proper placed flat spot, right length of head and correct shape of the nose to have the proper profile. The forehead is sloped back with a slight transverse flat spot in the middle of the forehead just above the eye ridge. There is a change of direction between the forehead and the roman nose. Shape: sloped back with a slight transverse flat spot in the middle of forehead just above the eye ridge. There is a change of direction (or “stop”) between the forehead and the roman nose. The flat spot is one of the most misunderstood parts of the Birman head. 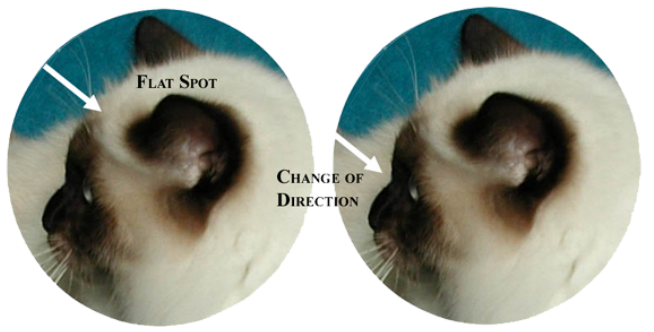 Many think this refers to TWO flat spots, one in front of each ear - THIS IS NOT TRUE! 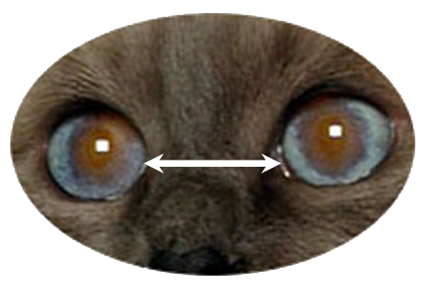 Although many cats have flat planes there, the standard is referring to the thumb-sized spot (almost a slight flattened indention) in the center of the forehead just behind the eye ridge. Higher up the head rounds out as it goes between the ears and forms the back of the skull. This helps once again to prevent the "domed" look of the Persian. The ears are almost as wide at the base as they are tall. They should be open at the base, have a slightly rounded tip, and be moderate in size, and placed moderately apart with furnishings. They should be very close to an equilateral triangle in shape. An equilateral triangle is one which has all sides equal in length. This helps give them a wide base. The opposite of this would be a "cupped" ear. The slightly rounded tips accentuate the round look to the head. By good grooming you can make sure there are no tufts to create a pointed look. Moderate in size - one of those relative terms, they should not be large like those of a Siamese nor small like those of a Persian. A good ruff can make quite a difference in how large or small the ears appear. The more common fault being ears that are too large, one seldom sees ears that could be considered too small. 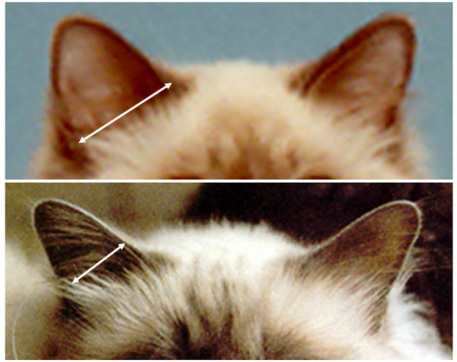 Set is probably the most important aspect, since a cat can get away with large ears if they are set properly. And usually if they have the correct set the proper shape will follow. 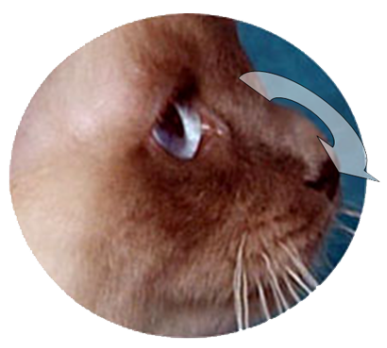 This too helps create the rounded image that is important to the Birman look. Too high set or "donkey ears" give a rectangular look that should be faulted. 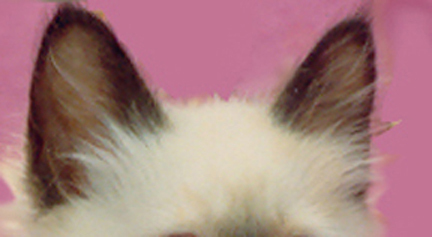 The proper ear set is a very important component of the "Birman Look" and can be one of the hardest to obtain in breeding. Top - wide base. The opposite of this would be a "cupped" ear. What are furnishings? 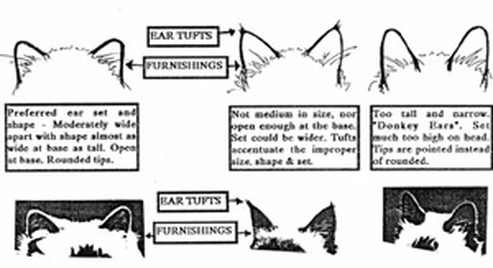 This refers to the hair growing horizontally from the inside of the ears, NOT the ear tufts on the tips of the ears. The eyes are medium to large, moderately rounded, and set fairly wide apart. They are blue in color, the deeper the better. 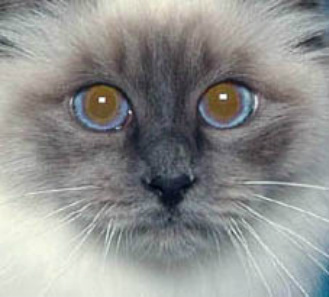 Birman eyes should have a nicely rounded appearance without the bulging look of those of a Persian or the slant of the Siamese. 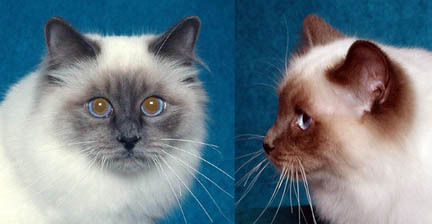 The ”moderately rounded" allows quite a variance in shape, and creates the different expressions seen on our lovely Birmans. And it's amazing how important "expression" is to each person's preference of "the look" they like. This goes along with the broad rounded head. You wouldn't want the eyes set close on a broad head. Set plays an important part in expression as well as shape and size. 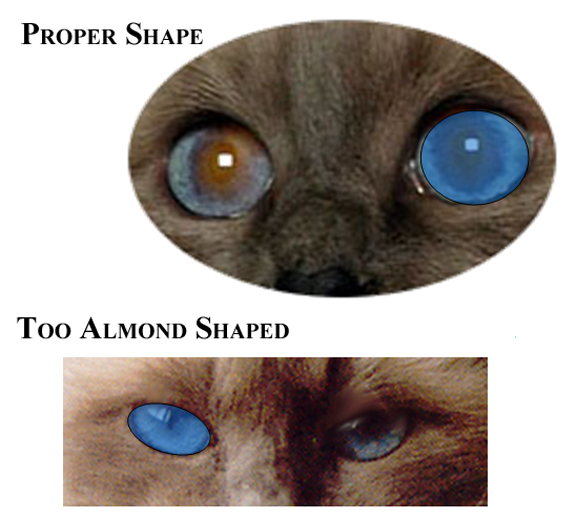 I believe everyone understands this, its just not always easy to get that dark blue eye color that the Siamese breed have, but they have been working on it a lot longer than Birman breeders. One thing I have noticed when you do see a cat with deep blue eye color, the eyes usually appear smaller than they really are. Especially on the seal points. The slightly lighter eyes stand out more and appear larger. One thing we must try hard to breed out is the greenish-gray cast that is starting to appear in some lines. The best way to judge eye color is to take the cat to a sunny window, the pupil becomes so small that you can easily tell the true color of the eyes.